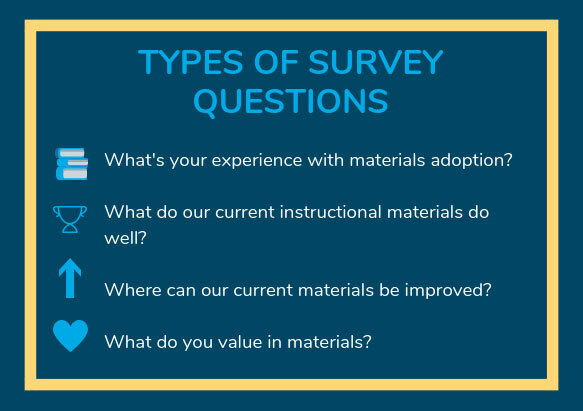 Educator Shannah Estep offers advice for districts about how to engage educators during the instructional materials adoption process. If your district is adopting new instructional materials this school year, you already know there are many things to consider as you get started: programs to look at, the quality of those programs, who will be involved in the decision making, and how you’ll communicate your process to the district at large. We’ve developed eight keys to a successful adoption process which can help guide districts from start to finish. 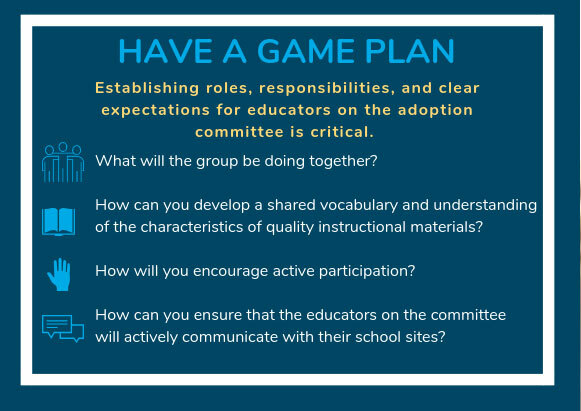 One of those keys includes engaging educators throughout your adoption with clear roles for how they can and should participate in selection. Teachers are uniquely qualified to have a voice about instructional materials since they’re the ones that spend every day working with them in the classroom. Know Who Needs to Be at the Table: This tip might sound obvious, but you’d be surprised at how many districts struggle with this. Adding educators for the sake of having educators won’t yield the best results. Instead, be thoughtful about what your needs are and what the various stakeholders can bring to the table. Conduct a needs assessment and consider what your data reveals at both the district and school level. This is key to deciding who is necessary for your committee and what role they should play. 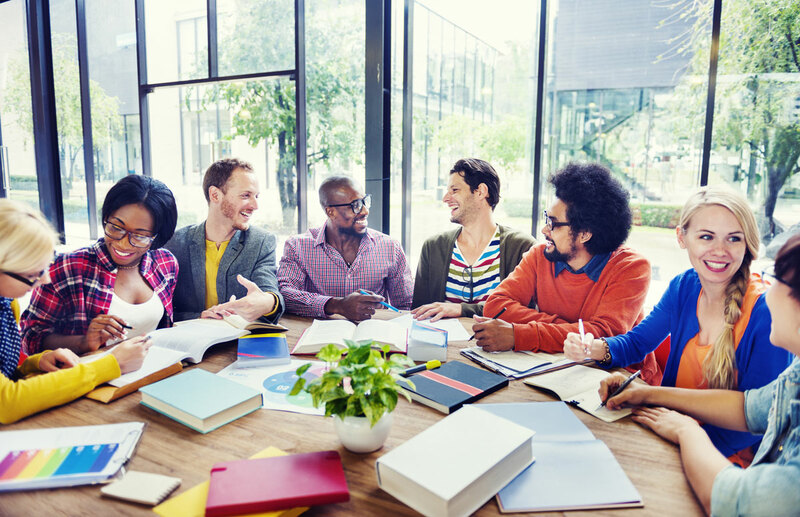 Ensure Diverse Perspectives: Successful districts we’ve worked with often include teachers representing each grade-level on their committee, but they don’t stop there. Incorporating instructional coaches, English language development and special education teachers, and district administrators such as professional learning and curriculum directors is also vital. A diversity of perspectives and expertise will help ensure that as instructional materials are selected all students’ needs are considered. While it can be a juggling act to engage educators in these ways, bear this in mind: including educator knowledge and expertise increases the quality of the selection process and having those voices actively sharing information with colleagues bolsters the adoption’s credibility, which builds buy-in for your rollout and implementation of the materials. Get Input Upfront: One way to ensure that all educators throughout your district have real input into the process is to conduct district-wide surveys. The information from these surveys can be invaluable and help inform the adoption process from the beginning. The feedback should also provide the district with data about the existing state of materials and usage in current classrooms. That’s why conducting a survey at the outset of your adoption is especially worthwhile. Surveys in Action: A small school district in Washington was innovative in their approach to engaging educators through surveys during their K-5 math adoption. They sent a three question survey to teachers at the beginning of their process and used the responses they received throughout selection. Teachers were asked about what they wanted and needed from the instructional materials. For example: were extensive English language learning supports a priority? Was it important that the materials offered strong technology components or clear opportunities for differentiation? Teachers could cite any and all of these kinds of aspirations. They were also asked which specific programs they wanted the district to consider. This district examined any program teachers asked them to consider. The suggestions from teachers, along with programs selected by the adoption committee, were equally evaluated for standards-alignment. As the programs were narrowed based on whether or not they were aligned to rigorous college- and career-ready standards, the survey responses came into play again. The local priorities that teachers highlighted (English language learning supports, differentiation resources, whole group vs. small group breakdowns, technology integration) were turned into a guide for the district as they evaluated their final choices and allowed them to ensure the program they ultimately chose would actually address the challenges the district faced and, most importantly, meet the needs of all students. Inclusion Matters: In this district, as in most districts, not every teacher was a member of the adoption committee, but leaders wanted to ensure that every single teacher had a real venue to share their voice. This later proved invaluable for buy-in around the materials that were selected. Surveys do not have to be used in exactly the same manner as this district in Washington. We’ve seen districts survey their teachers at different points throughout the adoption process: at the beginning for needs assessment, during the process to get a sense of how teachers feel about the materials being considered and to gauge the amount of access they’ve had to the potential programs, and afterwards to solicit thoughts on professional learning and the concerns teachers might have about how to use the new materials. We know that districts will have to tailor and choose approaches that make sense for them, but the overarching principle remains the same: prioritize some kind of mechanism to solicit educator feedback and make sure to apply what you’re hearing in real time. Ultimately, teachers are solely responsible for delivering the instructional materials a district decides to choose. For this reason alone, their experiences and expertise should inform what is selected. Bringing those educators into the process early on, with many opportunities to fully participate in the decision-making, can help guarantee a successful rollout and further support the implementation of those materials. What’s more, including educator voices will ensure that the needs of students stay front and center and that the content kids learn in school will truly prepare them for college and career. A school district uses consensus protocols to overcome divisions when selecting new materials. “There are thousands of us out here working. Let’s work together.” Educator Voice Matters. High School Teacher, Arthur Everett tells us why.